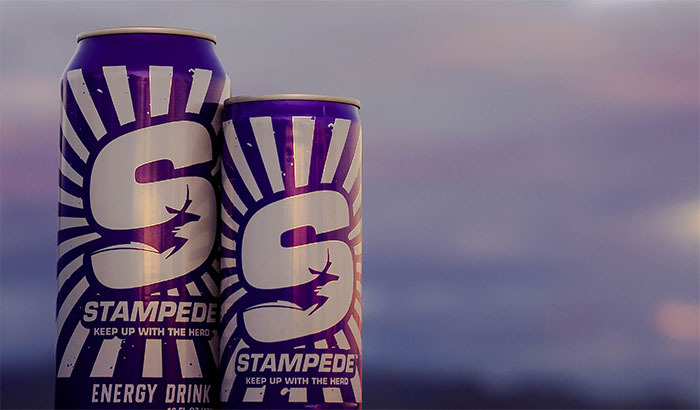 GCBC introduced its Stampede energy drink in 2017 and has expanded the popular brand by adding a larger 16-ounce can to the mix. The original offers 8.4 ounces. Few things on campus are more “GCU” than a cool Stampede energy drink to keep students alert for classes. With the increase of new Lopes on campus, along with the everyday hectic schedules of old Lopes and new, naturally, the Grand Canyon Beverage Company wanted to do something big to meet students’ needs. During the home basketball game against UT-Rio Grande Valley last week, GCBC General Manager Brennan Williams and his team introduced a new 16-ounce can of Stampede and immediately received feedback. With the continued success of the 8.4-ounce Stampede, GCBC strove to make this launch bigger and better than the ones before. He hopes the new can will offer Lopes the chance to select just how much of a boost they need, depending on how busy their schedule is. The business prides itself on weaving into the day-to-day lives of the GCU community, and introducing a new size is just the first step toward offering a variety of selections for customers. Williams said GCBC also is looking into experimenting with different Stampede flavors and even has considered a sugar-free alternative to the popular energy drink. Students see the need for a larger can for those days when the 8.4-ounce simply isn’t enough. “I usually don’t drink caffeinated beverages unless I really need the pick-me-up, so this is a more efficient way for me to get that pick-me-up without having to run to the Lopes Mart or The Grid to buy a Rockstar or a Monster Energy,” said Cameron Nunley, a student who’s a regular Stampede consumer.